Whenever I host foreign visitors in Tokyo, they invariably comment on the meticulous appearance of Japanese women. Depending on their viewpoint, my friends see this adherence to a particularly Japanese idea of beauty – elegant, modest, and feminine – as (usually) something admirable and aspirational, or (occasionally), evidence of a patriarchal society in which women are encouraged to conform to a tightly-defined aesthetic standard. Regardless of whether you think a focus on appearance is liberating or restricting for women, I agree with my friends. 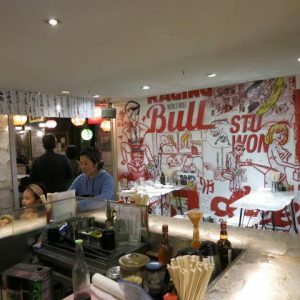 Having lived in London and New York – hardly shabby cities -the women I see around me in Japan, with their elegant clothes, well-manicured nails, ubiquitous high heels and neat haircuts, appear to have turned beauty into an unusually precise art form. I wasn’t surprised to discover, then, that there is a form of Japanese art devoted entirely to the concept of female beauty. Bijinga, which literally means “paintings of beautiful women,” is the theme of the latest exhibition at the Yamatane Museum of Art. 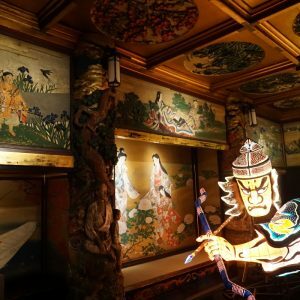 A short walk from Tokyo’s Ebisu station, the museum is one of my favorite places to explore the world of Japanese painting in its varied forms. While the Yamatane Museum does have some English-language translations, I was lucky enough to receive a guided tour of the exhibition in English by Alice Gordenker, a long-time resident of Japan and translator who works with many museums in Tokyo. 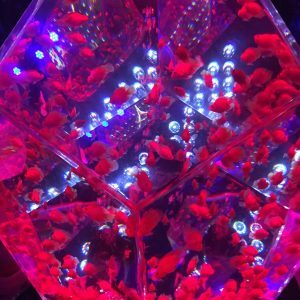 Along with the exhibition curator, Takahashi Minako, she set out to explain this captivating new exhibition, which addresses the portrayal of female beauty through art. 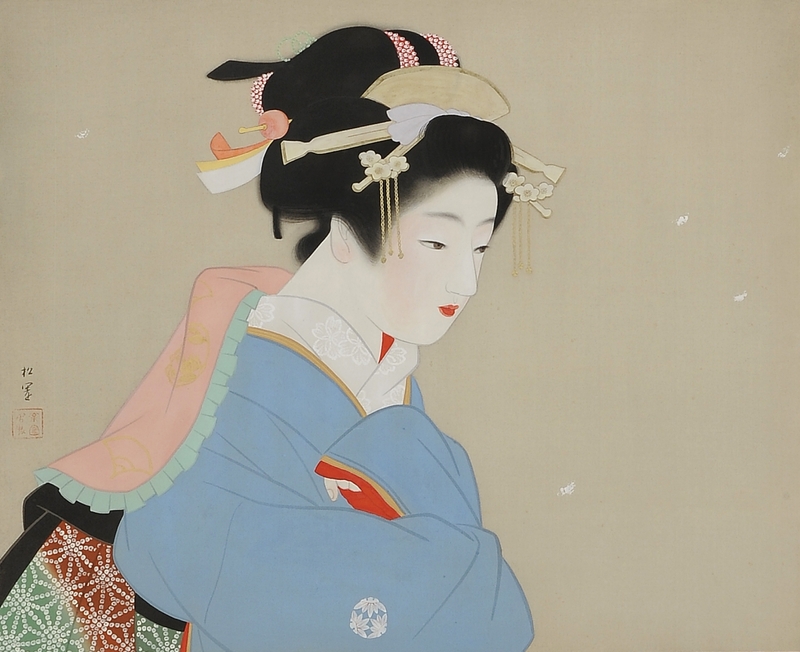 The exhibiton introduces the genre of bijinga through the work of the artist Shoen Uemura (1875-1949). Long after her death, Shoen is still a popular painter in Japan, and even at 10:30am the museum was crowded with visitors eager to see 18 of her works along with other artists’ bijinga on display. As Gordenker explained, Shoen was unusual for her time, a woman working in a field dominated by men. As the exhibition points out, this “outsider” status as a woman enabled her to acquire a deeper understanding of her female models and employ different approaches from male artists – a quality which, the curators argue, elevates her paintings by portraying women not just as objects created through the lens of the male gaze, but as thinking, feeling subjects who invite us to admire their inner beauty as well as their outward attractiveness. In her efforts to show female beauty in what she believed to be its purest form, Shoen’s paintings are characterized by both a lightness of touch and a depth of feeling. Gordenker invited us to take time to look closely at the works and consider the emotional complexity beneath the peaceful expressions of Shoen’s subjects. Coming from a background in Western art, I automatically associate exhibitions on the theme of beauty with nudes, the naked body being the ultimate indicator of beauty in ancient and post-Renaissance art. In comparison, I was struck that bijinga is notable less for women’s bodies than for the ways in which they are concealed. I was fascinated by the way Shoen depicted her subjects draped in layers of fabric, which are rendered with incredible naturalism. Gordenker explained that Shoen was deeply interested in fabric and scrupulously researched historical dress and accessories in order to reproduce minute details. 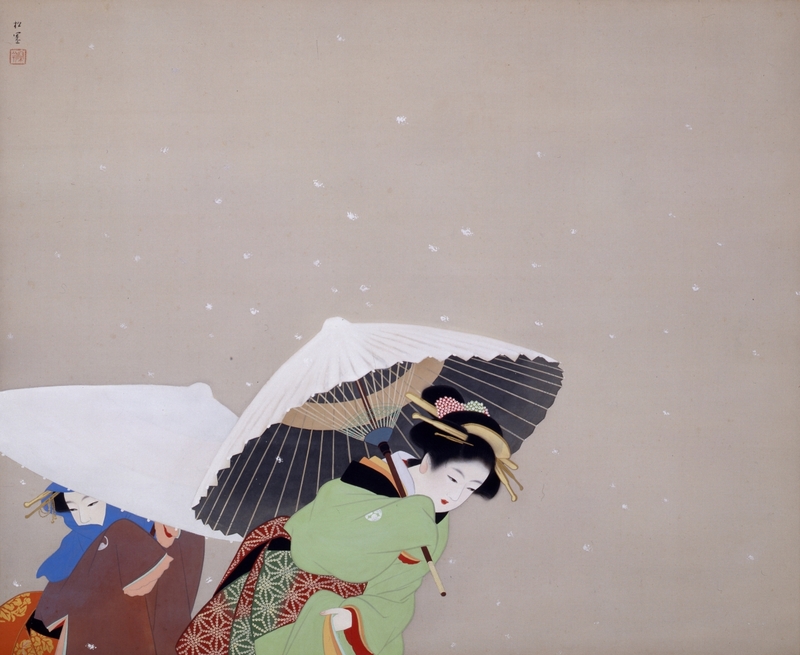 I particularly liked a painting entitled Snowy Day, in which the subject is depicted in a specific fashion worn by women in the Kyoto and Osaka region in the late Edo period before the beginning of the Meiji restoration in 1868. 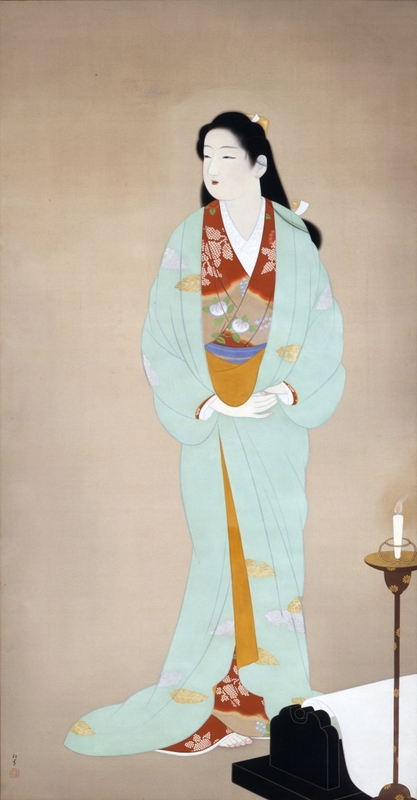 In contrast, Firefly, from 1913, shows a contemporary subject dressed in a fashionable kimono inspired by the international popularity of Art Nouveau. The exhibition was crowded, but the work was large enough to enable me to get up close and inspect the minute detail with which Shoen rendered the lilies adorning the fabric, allowing for glimpses of the silk background to show beneath the paint, creating texture and sheen. Another thing I noticed was that in this painting and many others, Shoen’s subject is shielded from the observer. As in a later image of the same name, the figure is viewed partially hidden behind a semi-transparent screen. 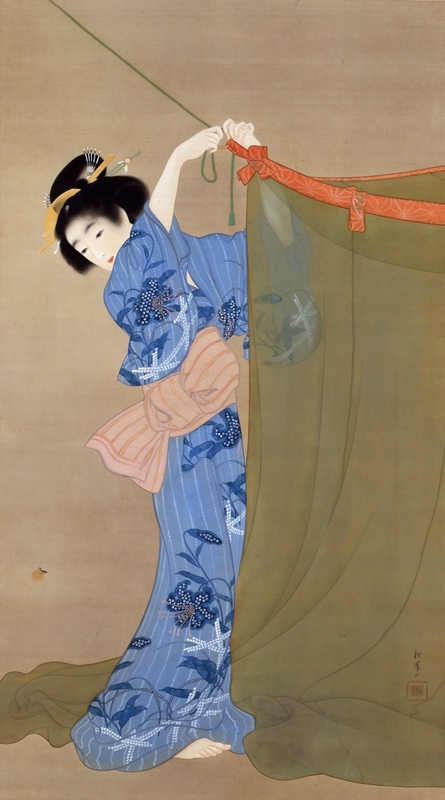 While this trope is popular in traditional Japanese art, Shoen’s women repeatedly seemed to shrink from my gaze, their covered hands and obscured faces pointing away from their physical shape and toward their inner thoughts. One of the most interesting aspects of Gordenker’s tour was her explanation of how Shoen gives agency to her subjects through a variety of techniques. In many paintings, she used a splash of red pigment on the women’s earlobes and fingertips to animate their otherwise placid demeanor. This small, yet visually enlivening, detail signals activity: these women hear; they touch. Often beautiful women are painted as objects of desire and admiration, yet through the composition of her work it seemed to me that Shoen invites her viewers to question their interior thoughts as well as appreciate their external beauty. The sparse background of Feathered Snow (1944) not only gives the impression of a punishing winter wind which beats its subjects back to one side of the painting, but encouraged my eyes to follow the movement of the composition and rest on their faces. What are they thinking as they trudge through the snow? The title of a work from 1941 depicting an immaculately dressed woman reading a book made me laugh. Shoen called this painting Tedious Hours, revealing that the subject is clearly less serene than bored. Thanks to the close friendship between Uemura Shoen and the founder of the Yamatane Museum, Yamazaki Taneji, the museum owns the world’s largest collection of Shoen’s art. Her work is given context however by a range of other works of bijinga, which presents examples of the genre right up to the present day. 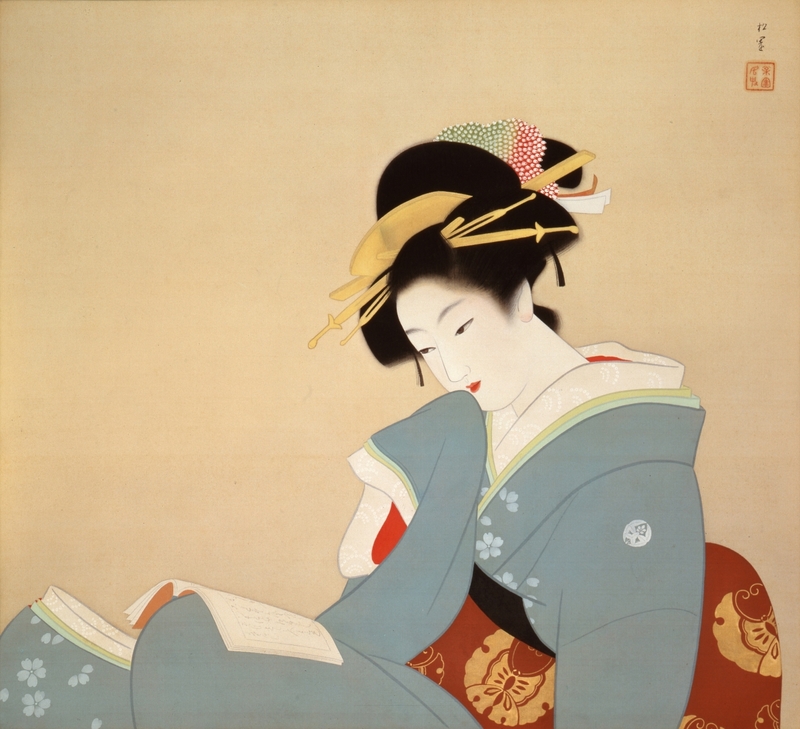 Following the paintings by Shoen, Gordenker led us through a section called Famous Women from Literature and History, explaining the influence of Shoen’s focus on the inner aspects of women’s beauty. My two favourite exhibits in this section were both entitled Deep in Thought and depicted famous women — the Meiji-period novelist Higuchi Ichiyo, who you will discover on your 5,000-yen note, and Julia, the Christian wife of a prominent figure of the Sengoku Period (1467-1567) — beautiful as much for the composure of their mind as for their physical form. In contrast, the next section focused on the stylized beauty of maiko and geisha, emphasizing what artist Hashimoto Meiji described as ”perfect beauty acquired through discipline and practice.” Yet, the beauty found in the bijinga exhibited here is not the kind of attractiveness manufactured through makeup and finery. Instead, it pays homage to a concept of beauty as something created through the composure of the subject, the composition of the painting, and the care with which both subject and artist attend to details. By the end of the exhibition I really had the sense that the beauty of this bijinga is a collaborative effort between artist and subject. The Yamatane Museum specialises in Nihonga– — Japanese painting from the 19th and 20th centuries. Perhaps in reference to the frequency with which Japanese paintings are traditionally moved around within the home, and no doubt also taking into account the environmental sensitivity of the works on display, the museum presents new exhibitions with impressive regularity. The average show lasts about two months. My major regret on this occasion was that I didn’t leave enough time to visit the excellent cafe, to enjoy the specially-designed wagashi commissioned to echo artworks from the exhibition. I’ll definitely be back though — repeat visitors to an exhibition can show their original ticket for a discounted rate. I left the exhibition full of gratitude to Takahashi Minako, the chief curator of the Yamatane Museum, and Alice Gordenker, for their enlightening tour of this exhibition. Roisin Inglesby is a historian and curator, currently living in Tokyo.